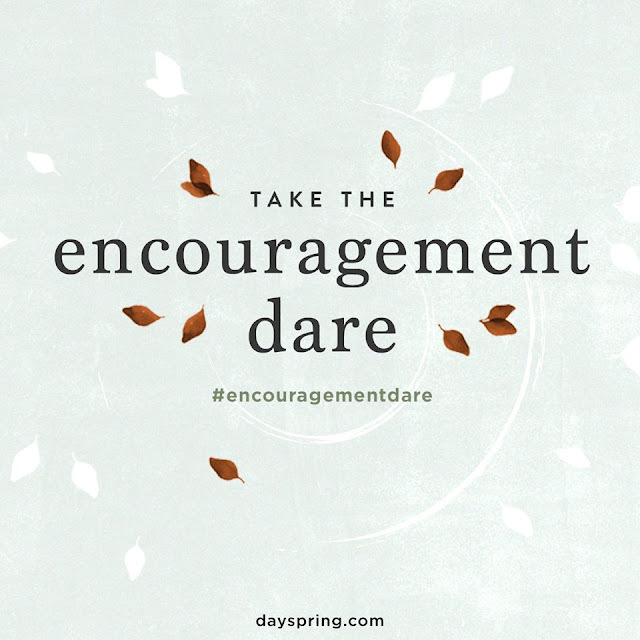 The Dayspring Encouragement Dare is coming to a close! All this week I have so loved following along with fellow participants to see how they are spreading the encouragement around. There truly are so many great ways to spread encouragement around and you never know just how much it can mean to someone. Have you ever been out and about and gotten a compliment on the outfit you were wearing that day? Worked hard on a project and received a job well done? Have you ever gone to grab your morning cup of coffee and found the car in front of you had paid for your drink? Isn't it amazing what those simple acts of kindness can do to turn your whole day around? A few weeks ago, we took our family out to eat at my husband's favorite restaurant. My husband had just gotten back from a month of military training- we were celebrating but admittedly exhausted. During our meal, my daughter decided to give a show singing 'This Little Light of Mine' for anyone around. And they loved it... just her in her childlike innocence offered encouragement to the families around us. They thanked her for the show and let us know how much they appreciated it. We thought that was that. But as we were checking out our waitress came up to us with two to go boxes. The couple sitting next to us had so enjoyed the show that they bought dessert for both of our children as a thank you. It wasn't something they had to do, but it was something that we very much appreciated. They were encouraged by our daughter, and in turn turned around and offered us encouragement too. That's the thing about encouragement.... it's contagious! When you make someone's day with your encouragement, they want to pass it along. And so, while the official dare may be coming to a close... I want to challenge all of you to keep it going! Keep on encouraging. Keep on paying it forward. Let's make encouragement week last all throughout the year! My family & friends offered me so much help, support, and encouragement after a difficult divorce. I am so grateful to them.